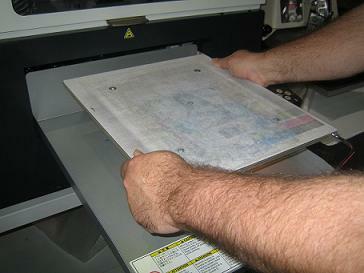 Installing the GT Cap Platen on GT Printer. 1. 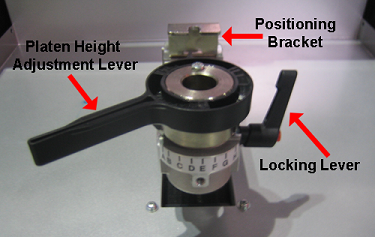 Loosen the Platen Locking Lever. 2. Using two hands, pull the Adult Platen straight up and out of the Platen Stem. 3. Insert the center pin of the GT Cap Platen into the Platen Stem. 4. 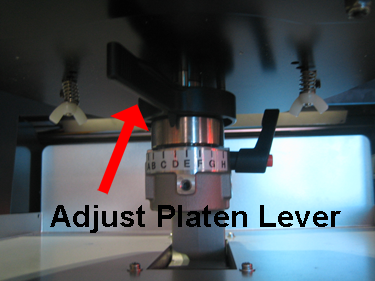 Move the Platen Height Adjustment Lever to raise / lower the GT Cap Platen to the correct height. 4. 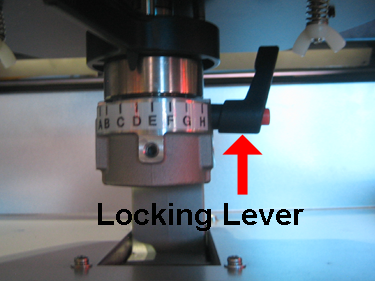 Tighten the Platen Locking Lever. 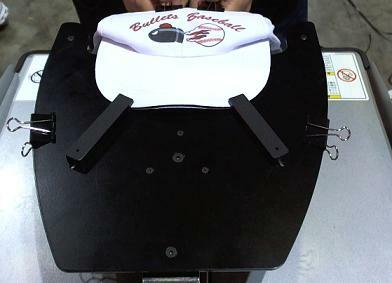 Loading a Cap on the GT Cap Platen. One of the core principals we had from the beginning was to make it as easy as possible to get a curved crown as flat as possible to print on. 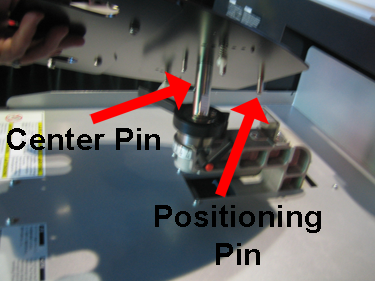 Below are the steps for loading a cap on the GT Cap Platen. 1. 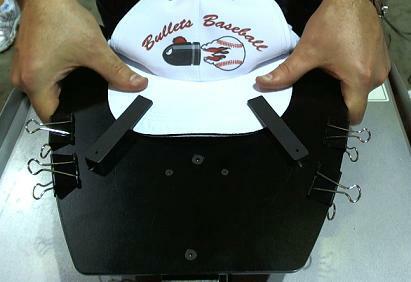 Flip down the sweat band on the inside of the cap. 2. Slide the front of the bill under the spring loaded bill holders. 3. Pull the crown of the cap back to the riser till the sweat band catches under the lip of the riser. 4. 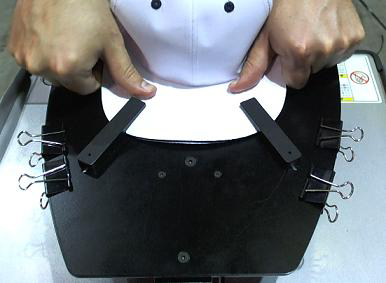 Use the black clips to lay the crown of the cap as flat as possible across the riser. 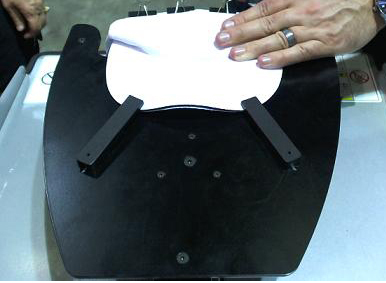 How to Remove a Printed Cap from the GT Cap Platen. Once the cap is printed, you can follow these instructions to remove it from the platen and cure it. 1. Remove the black clips that are holding the crown of the cap flat across the riser. 2. Slide the front of the bill forward under the spring loaded bill holders. 3. 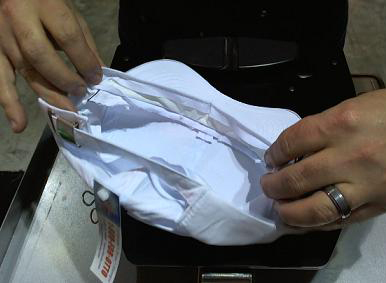 Once the sweatband is under the front lip of the riser, left up and remove the printed cap. The springs under the bill holders make it easy to remove the bill from under them. The GT Cap Platen comes with some recommend artwork templates for CorelDraw (CDR file format), Photoshop (PSD file format) and as a PNG transparent file. To download the artwork templates, complete the form below and a personalized link will be emailed to your email address. Here is a video that shows how to use the artwork templates for CorelDraw and Photoshop. Included in the artwork templates is the Cap Print Grid. We recommend to print the Cap Print Grid on the cap you are using with the riser / spacer combination to determine where the artwork should be placed to show up in the graphic software program to print in the proper location on the cap. The Cap Print Grid also allows users to determine if printing on a specific location on the bill will be crisp enough if using a spacer. Below is a picture of the Cap Print Grid on a cap. Notice that on the sides of the caps there are areas where artwork cannot be printed. Working with Artwork for Printing on GT Cap Platen. 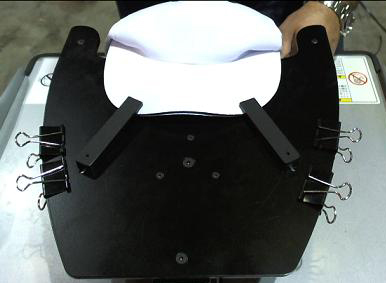 We designed the GT Cap Platen so that the front of the riser being used would start 5 inches from the center of a 14″ x 16″ template (standard Adult Platen size) and the top of the Large Riser is at the top of the 14″ x 16″ template. 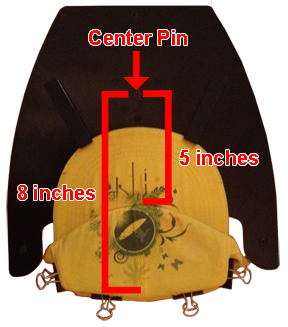 So placing your artwork in at the top center of a 14″ x 16″ platen will help with the placement of the artwork.The standard visible area of cap when being worn is approximately 3″ in height. So the Large Riser provides approximately 3 inches of printable area. However, some low profile caps may require the printable area to be smaller. In addition, the size of the bill on caps can vary as well. So the artwork templates provide a good starting point, but some adjustments may need to be made based on the cap being used. It is important to understand that if you are going to print on the bill of the cap, you will need to allow for room for the bill to slide back under the spring loaded bill holders in order to remove the cap. 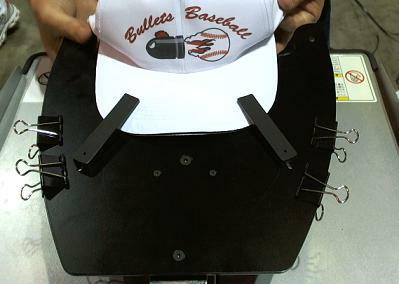 This will allow the sweat band to come out from the lip on the front riser and allow for the cap to be easily remove. So keep this in mind when creating your artwork. Setting the Print Direction on GT Printer. display unidirectional mode is selected.